We've all heard myths about bugs, but do you know what's fact and what's fake? Me - fact or fake, I just want those bugs GONE! That daddy long-legs spider isn't poisonous? I'm still going to smash it with whatever's handy if it comes in my house. Or, better yet, get someone to do it for me, though sometimes that's not an option. Currently those tiny little gnats that love to buzz around fresh fruit or my wine glass are the most annoying bug problem in this house. Those things are so irritating! Should you need some help getting rid of bugs in your house, remember Orkin. Orkin uses the latest technology and unparalleled training to develop a treatment that's right for your home and your needs. To learn more about pest control that's based in science, or to schedule an inspection, visit orkin.com or call (844) 503-8251. Take Orkin’s Scientific Fact or Scientific Fake™ Quiz to test your bug knowledge. Be sure to watch every clip for the scoop on these infamous bug myths and share the quiz with your friends. Perfect for your little backyard explorer! To enter, simply leave a comment here. Tell me how you did on the Fact or Fake Quiz or share your own bug story. 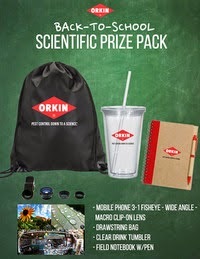 You can earn extra entries by tweeting about this giveaway and using the #OrkinMan hashtag. Shares on Facebook and Google+ will be counted, too, Just be sure to link to this giveaway and make sure I can see your post so I can count it. You can tweet and share once per day per social network. Be sure to leave a separate comment for each tweet, post, and share. Giveaway is open to U.S. residents, and all entries must be received by 11:59pm ET on August 31 2014. Good luck!